Holiday Boarding for the smaller pets. Talley Wags can also provide holiday boarding for your Rabbit, Guinea Pig, Hamster, Gerbil or other small animal. Many people are lucky enough to have a friend or relative to look after their pets when for whatever reason, they are unable to do so. However, for many people this is not the case and there is nothing worse than as a holiday approaches realizing, that there is no one you can trust to care for your pet. Alternatively, you may have the opportunity to work away from home but can't take your pet with you, or you may be moving house and boarding your pet during this time is one less thing to worry about. Whatever the reason, Talley Wags Small Animal Boarding service can help. 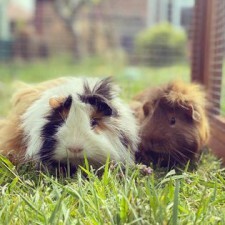 Our sole aim is to ensure that while your pet(s) is staying with us, he/she is as happy and contented as possible, whilst being kept in the best of health. We keep a close eye on our guests, giving them a health check daily and twice in hotter weather. Your pet will not mix with any other boarders other than those he /she is brought in with. Bonded pets are always kept together. All we ask is that you bring the dry food mix your pet prefers as they are much healthier and happier sticking to what is familiar to them and their own water bottle. You can of course, bring along any favorite toys and treats. We have even had bunnies bring along their own beds and rattles to play with. All hutches and runs are cleaned out daily. Our Hutch Homes are in a secure pen so there is extra safety and security for all Small Animals. All our guests look out on to a lovely Cottage Garden, which is very peaceful, relaxing and beautiful scenery for them all. In dry weather runs will be on grass in the beautiful Cottage Garden they look out onto, however if the grass is too damp they will be placed in the paved enclosed run. This has the added bonus of keeping their claws filed! Please let us know if too much grass upsets your pet’s tummy! Pets are transported to runs in a carrier to prevent accidents. Even the softest pets can be spooked and try to leap out of your arms. 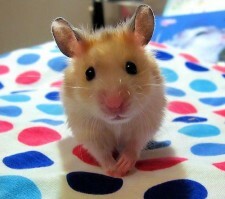 Hamsters, Gerbils etc will be kept in their own cages you provide from them.